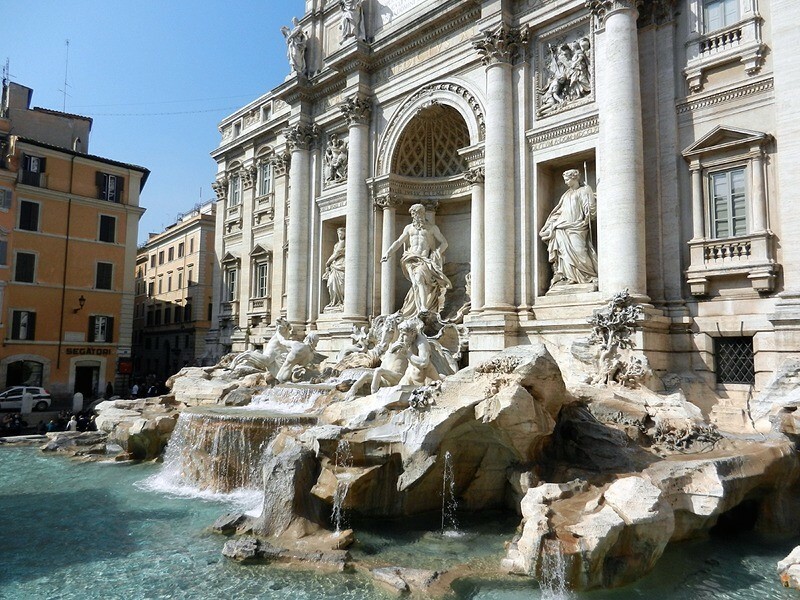 The architect Nicola Salvi, famous as the designer of the Fontana di Trevi – known in English as the Trevi Fountain and one of the most famous and most visited monuments in Rome – died on this day in 1751. 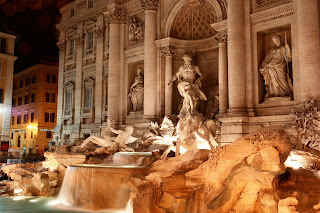 He was working on the Trevi when he passed away, having been engaged on the project since 1732. It had to be finished by Giuseppe Pannini and the giant statue of Oceanus – the Titan God of the Sea in Greek mythology – set in the central niche, was completed by Pietro Bracci, yet Salvi takes credit as the lead architect. Salvi ran a workshop in Rome that he had taken over when his master, Antonio Canevari, left the city in 1727 to take up a position working as architectural consultant to the king of Portugal in Lisbon. He completed a number of commissions on behalf of Canevari but spent a good deal of his time tutoring others and might have made very little impression on architectural history had he not submitted entries for two design competitions run by Pope Clement XII in 1732. One was for a new façade for the church of San Giovanni in Laterano, for which his design was commended and in which he did have some input along with Alessandro Galilei – the winner – and Luigi Vanvitelli. The other was to revive a project started and then abandoned by Gian Lorenzo Bernini one hundred years earlier to design a new fountain at the end of the former Aqua Virgo Roman aqueduct, in front of the Palazzo Poli. Accounts of the outcome vary, but there is agreement that Salvi’s design did not win, with plans submitted by either Galilei or Ferdinando Fuga preferred. 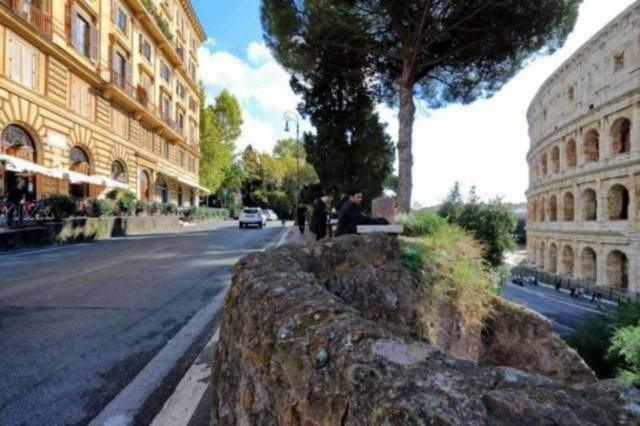 However, both of those architects were from Florence and there was a public view that the job should go to a Roman and, after considering this, the pope decided to give it to Salvi. Salvi imagined a fountain composed of a large central basin, surrounded by a rough-hewn cliff from which the Palazzo Poli appears almost to have been carved, the whole composition dominated by the statue of Oceanus, set into the central arched niche of the palace, standing directly above the point at which the water emerges. The monumental façade of the Palazzo Poli was designed by Vanvitelli to provide the fountain with a suitably dramatic backdrop. The end product, which takes its names from its location at the convergence of tre vie – three roads, represented a classic of Roman Baroque, the largest Baroque fountain in the city and the most significant building built in Rome in the 18th century. It defined the career of Salvi, who had been born in Rome in 1697 to a wealthy family thought to have been from Abruzzo originally. Precociously intelligent, he studied mathematics and philosophy before turning to architecture. Until the Trevi, after a decline in the number of major structures commissioned across the city compared with the previous century, Salvi’s work had been relatively inconsequential, consisting for the most part of small, decorative projects. He did build a baptistery at the Basilica of St Paul Outside the Walls but that was destroyed in a fire of 1823, while his reconstructed Chiesa di Santa Maria a Gradi in Viterbo was flattened by bombing during the Second World War. Salvi died at his home in Via della Colonna in Rome at the age of 53, having developed bronchial problems as a result of many hours spent working in the damp tunnels of the aqueduct. The ritual of throwing coins over their shoulders into the Trevi Fountain is followed by thousands of visitors each day. They used to be stolen regularly by gangs of thieves but a law was introduced making it a crime to fish coins out of the basin. Nowadays, the coins are collected by teams of municipal workers every night and given to a charity called Caritas, which converts the money into shopping vouchers for Romans who have fallen on hard times. The coins collected add up to around €3,000 each day. 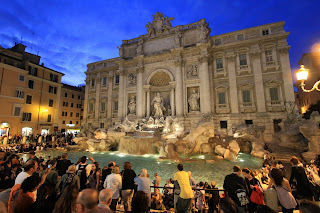 Part of the Trevi Fountain’s fame around the world is down to the starring role it has played in a number of movies, most notably Federico Fellini’s La Dolce Vita, in which Anita Ekberg jumped into the fountain fully clothed, to be followed by Marcello Mastroianni. 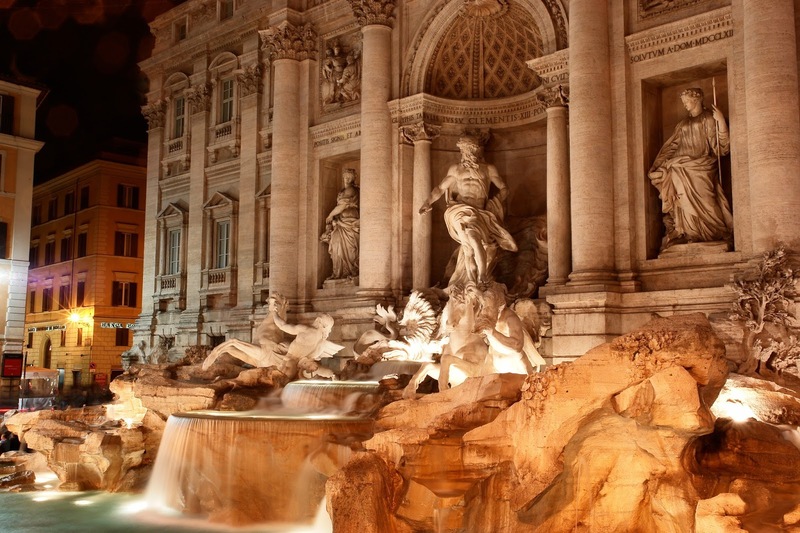 The monument also featured in Roman Holiday, Three Coins in the Fountain and Disney comedy The Lizzie McGuire Movie. When the revered Mastroianni died in 1996, the fountain was turned off and draped in black crepe as the city’s tribute.